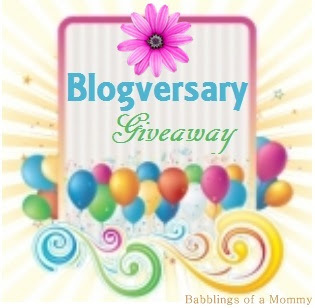 Babblings of a Mommy: Happy Blogversary To ME...And A Cool Giveaway For YOU!!--CLOSED. Happy Blogversary To ME...And A Cool Giveaway For YOU!!--CLOSED. I can't believe a year has come and gone in a blink of an eye! I started Babblings of a Mommy the last week of March 2010, but didn't really put any effort into it until the beginning of April--So I'm officially calling this week my Blogversary Week! I also want to take this time to express my gratitude to all of you for following my little blog. Thank you for taking the time to come back, time and time again just to read with this crazy mama has to say. I really can't thank you guys enough. It's really because of you that I've been able to partner with amazing brands and meet some incredible people in this short period of time. But for now, to celebrate my Blogversary and to show a little token of my gratitude I've partnered with AJ's Collection to bring you a jewelry giveaway!! 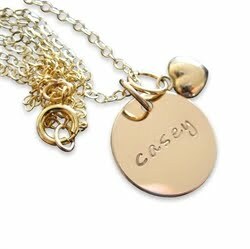 AJ's Collection is a family owned company that specializes in hand-stamped and personalized jewelry. They've taken their small creative hobby and turned it into a full-fledged business by creating one of a kind jewelry perfect for moms and loved ones! They have everything from delicate necklaces to charming bracelets and even have a few gifts for men, like guitar picks and money clips--all which can be personalized just for you or that special someone. The necklace came out absolutely adorable! I LOVED it. The gold disc is simple, but stands out when worn, and the heart adds a sweet little touch to top it off. The perfect combination! ..and Mema, what did she think? Now, for you lovelies: AJ's Collection is graciously giving one (1) lucky Babblings of a Mommy reader an item of your choice from their website! Go to ajscollection.com and tell me which product is your favorite and would choose if you won. It's that simple! "Like" AJ's Collection on Facebook. Be sure to leave them a comment letting them know your entering this giveaway. Follow me on Twitter and tweet this to me: "I hope I win the AJ's Collection Jewelry from http://babblingsofamommy.blogspot.com @babblingofmommy"
Remember each one counts as a different entry so be sure to enter them separately. Giveaway ends April 22nd . A winner will be selected by random.org and will be announced on my blog, so be on the lookout for your name! Happy Blogversary!! Wow! 1-year... very cool. I absolutely love the Lucky Two necklace with the heart... perfect for to list my "lucky" two. Think these are beautiful necklaces! I would choose the Two Peas in a Pod with Charm Necklace and have my twins boys' initials stamped on the charm. My twins passed away almost 8 months ago (they were born premature) and we always called them "Two Little Peas in a Pod". I love the Circle of Love II! I follow you on Google Friend Connect (Lauren @ Hobo Mama). Happy one year! So exciting! And what a great giveaway! I love the circle of love necklace, but they are all just adorable! Circle of Love with multiple charms. 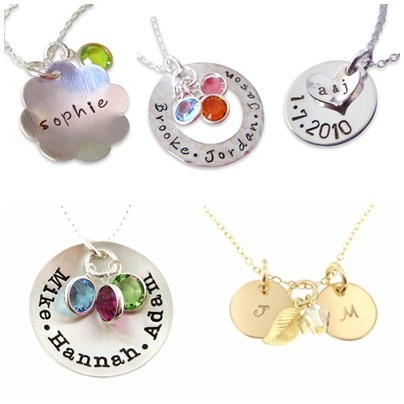 If I won, I would choose the Personalized charms necklace with two peas in a pod. I would choose the Hand Stamped THREE Monogram Sterling Silver Disc Pendants! I absolutely love everything though!! I like AJ's Collection on Facebook and left a comment telling them I entered their giveaway! I would choose the Ultimate I Love You To the Moon and Back Necklace! Lucky Four Necklace with the names of my four beautiful children! I love the tiffinay inspired hand stamped bracelet! I love the 'A date to remember' charm necklace. I'd choose the Nostalgic Vintage necklace! is the beautiful piece I would pick. The Wax Seal Fine Silver Initial Necklace is lovely. I really like the " A Date To Remember Charm Necklace"
If I win that would be the one I choose! Open Heart Sterling Silver Necklace is my favorite. Although, it was so hard to pick just one! I am your facebook fan & liked your page. I commented saying that I entered the AJ giveaway! I became a new GFC follower. - I believe its shorch, then again... it could be camsmommy. I'm still trying to get the hang of GFC. Happy Blogversary to you. And thanks so much for giving me the opportunity to enter the contest! So many beautiful items to choose from! I really like the Cirque du Amore necklace though! I like AJ's on FB and left a comment. I would get the heart necklace with the three stones. Love the modern love 3 charms necklace...great stuff. I would get the Tiffany inspired bracelet! I would choose the i love you to the moon and back necklace. I would choose the Love You to the Moon and Back necklace. Happy Blogversary!!! I LOVE the '2 Peas in a pod necklace w/name tags' & the Yiffany-inspired SS bracelet the best!!! ((1955nursehjc4me(at)myway(dot)com)) Thanks! I "LIKE" AJs collection on FB (HollyCunningham) such cute stuff!!! ((1955nursehjc4me(at)myway(dot)com)) Great giveaway! I follow you via GFC ((1955nursehjc4me(at)myway(dot)com)) Congrats!!! I would get a B monogram for my snuggle bug, Bryce, and the orange topaz for his birthstone! Love it!! The Wax Seal Fine Silver Initial Necklace is so beautiful. I Like AJ's Collection on Facebook and left a comment. I already liked your FB page and I left a comment as Audrey F.